Tracksounds: Oscar Award Ceremony Changes for Composers? 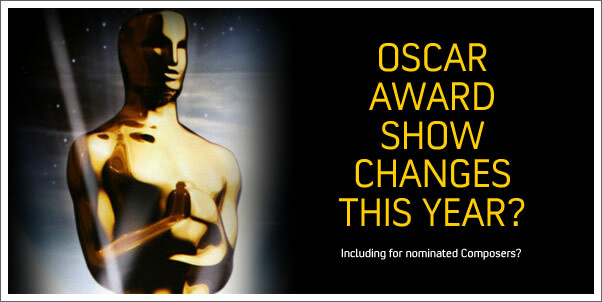 Oscar Award Ceremony Changes for Composers? "Cinematographers, editors, composers. All of you guys. You're in for a big surprise." I'll be happily surprised if they just give the award to the person I feel is the most deserving. In this year's case, that would mean that ALEXANDRE DESPLAT would walk away with the golden hardware. I take that back...if THOMAS NEWMAN won for WALL*E, that, indeed, would be a big surprise...and one that I think I'd be pretty happy about...even though I wouldn't call Wall*E the most deserving. What do you think the Academy has up their sleeves? Do you even care?